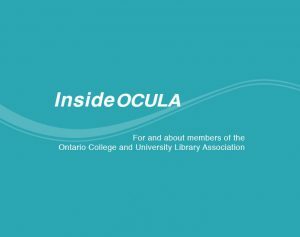 InsideOCULA is the official publication of the Ontario College and University Library association (OCULA). InsideOCULA strives to be an inclusive, relevant and informative publication focused on building and fostering an engaged academic library community. InsideOCULA is produced on an ongoing basis, with new content being published five times a year. We welcome submissions that address OCULA’s philosophy as well as current trends and practices in academic libraries across the province and Canada. All materials submitted for inclusion in InsideOCULA are subject to editing for consistency, length and style. InsideOCULA adheres to the InsideOCULA Style Guide which is based on Canadian Press standards. In the event that significant changes result from editing decisions, the InsideOCULA editor(s) will contact the submitting author(s) for approval before printing. The editor reserves the right to edit or refuse any submission. Views expressed or implied are those of the individual contributors or sources quoted and do not necessarily reflect OCULA policy. Like the Ontario Library Association, OCULA strongly supports the general principles of open access and Open Shelf uses the Creative Commons non-commercial Share-Alike license. As such, the sharing and redistribution of material appearing in InsideOCULA are encouraged, i.e., authors may re-publish their articles as they see fit and permission is not required. Nonetheless, reprints of all InsideOCULA content should include a reference or link to the original InsideOCULA article. InsideOCULA does, however, prefer original features content and so generally previously printed feature articles or interviews (or revised versions of previously published content) will be considered only under certain circumstances. Authors are requested to alert the editors to any previously published versions of their submission(s) and, where necessary, are responsible for obtaining copyright permission for reprint. Articles published without proper permissions will be removed from the publication. The author must secure the individual’s permission in writing for use of the images that contain a recognized individual, or a recognizable portion of an individual,. Photos taken at public events, news events or crowd shots taken in a public place do not require permission from the subjects. Articles should follow the InsideOCULA Style Guide. Please read and apply the guide before submitting your article. All materials submitted for inclusion in InsideOCULA are subject to editing for consistency, length and style, according to these guidelines and the InsideOCULA Style Guide. In the event that significant changes result from editing decisions, the InsideOCULA editor will consult the submitting author(s) before printing. Research Spotlight is intended as a “sneak peek” at the exciting research being conducted by employees at Ontario’s college and university libraries. It will offer readers a taste of the diversity of topics and methodology explored in library and information science research and provide a quick dose of professional development. The column may also afford opportunities for collaboration as OCULA members discover shared research interests. Submit your finished article in electronic format as a Word or Word compatible document as an email attachment to the editor at insideocula@gmail.com. It should be in Times Roman, 12-point, single-spaced throughout, and with no fancy formatting. All submissions should be accompanied by at least one image related to the article. Photographs, illustrations, images and graphs should be submitted electronically as a separate attachment. Photo size must be a minimum of 72 DPI (dots per inch) and saved as a JPG. Caption and credit(s) should be provided for all images submitted. In the case where the authors of the articles do not own the copyright for graphic materials, they should obtain permission to use these materials prior to the article submission. Images published without proper permissions will be removed from the website. All authors are asked to include a brief – 1-3 line – biography and a headshot with their submissions. The biography and headshot will be used included in the Contributor section of OpenShelf.